Looking for a sun-drenched, family holiday? Then look no further than the Broken Head Holiday Park. At the Broken Head Holiday Park we are in prime position to accommodate you and your family, whatever your needs shall be, we’ve got the lot! For those water babies; our park backs onto some of the best, most pristine beaches in Northern New South Wales. Our friendly reception team can book you in for surf lessons, a kayak tour around the area or even a snorkel where you will see some of our amazing local marine life. If you’re looking for something a little more affordable just stick with swimming in the crystal clear waters of Broken Head- you may even get to meet the local dolphin pod who play in the water quite regularly! For those guests who prefer the land; bring the skateboards, rip-sticks & helmets and visit the Suffolk Park skatepark, just around the corner. The kids will have endless fun on the back and forth set up with fun box, rails, curved ledges on deck and an open ended bowl about 4 foot high! Finish your busy afternoon off by relaxing in the park while the kids swing in the playground, located in the nature reserve at the entrance to the Broken Head Holiday Park. What could be better after a long day with the kids than a delicious ice-cream! ‘In The Pink’ is Byron Bay’s very own gourmet ice-cream store, featuring homemade ice-creams in a range of weird and just plain wonderful flavours. It is just a short drive from the Broken Head Holiday Park and the perfect ending to a fun filled day with the family. So what are you waiting for! 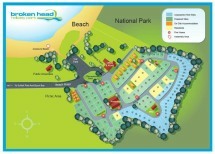 Pack the camping gear, gather the family and come stay with us at the Broken Head Holiday Park. We have everything you need to make your family holiday just perfect!